DMI is delighted to offer you our unique, u-shaped, side sleeping pillow. This ergonomically designed pillow has been specifically tailored to cradle and support your head, neck, and arms giving you a firm yet contouring cushion of support all through the night. Stop waking up with a tight neck and a sore back and start enjoying a full night night of natural, wake-free sleep and pain-free mornings. Each DMI pillow features a cooling earcup divot. This ergonomic pocket allows you to cooly and comfortably side sleep without friction or pressure on your ears. The unique padded divot also allows air to pass through the top pillow resulting in a cooling pad of comfort all through the night. Our contouring pillows feature a firm, hypoallergenic, polyester filling with just the right amount of sink and support. The firm, foam core won’t sag or engulf your head as you sleep allowing for a restful night without constant wrestling with your pillow in search of the cool or supportive side of the pillow. 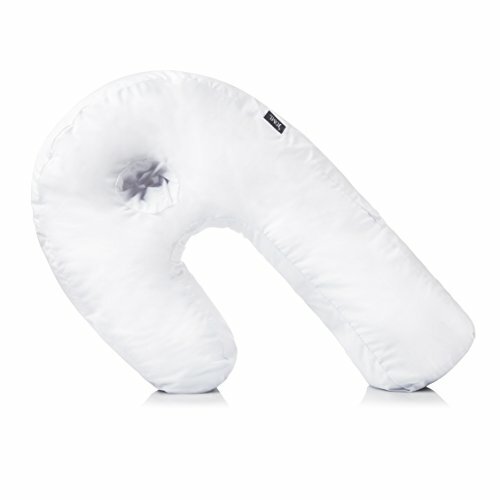 The DMI pillow offers premium support for those on the go. Our pillow is perfect for business or personal travel and is small enough for easy use in cars or on planes. Travel with the pillow in your suitcase for restful and steep filled nights at hotels or family members homes. Each pillow comes with a soft, breathable Easy clean case. The cooling, cotton blend cover is machine washable and helps to prevent allergies, dust mites, and germs for years to come. Discover a quality of life that comes with a good night’s sleep and embrace your side-sleeping pillow today.